Are you a content creator struggling to manage your content editorial calendar? Is your blog struggling from consistency? Are you struggling to grow your traffic? If so, NLL has partnered with CoSchedule on this post to help you master your content calendar like a pro. As an entrepreneur I understood that consumers are closing the gates on traditional marketing. They spend most of their time browsing the web, where they get their information, and own DVRs and subscribe to Netflix to bypass television advertising. As a result, content marketing has taken center stage. Content marketing is a strategic approach of consistently creating, and curating valuable and relevant content, to engage a clearly identified audience - used by editors, bloggers, marketers and media agencies. And if you provide any kind of product or service, content marketing should be a part of your marketing strategy and you can benefit from using a content editorial calendar. Blogging is an integral part of my business, and as the editor-in-chief of this digital magazine, I too struggled with consistency. Something I know most of you content creators or creatives also struggle with. Whether you are creating content full-time or as a side hustle, not having a consistent content editorial calendar can mean losing out on opportunities. What I quickly learned is that, as my blogging business grew, there would be more brands interested in working with me and my digital assets. So having a CONSISTENT content editorial calendar was important. 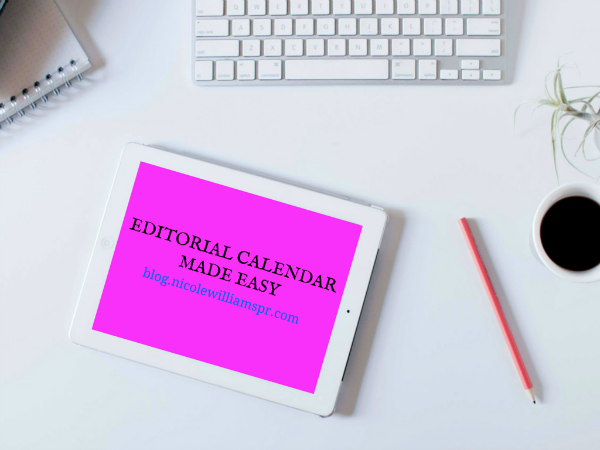 I've tried a variety of traditional content editorial calendar, but CoSchedule content marketing editorial calendar plugin for WordPress was my soul-mate. Integrated with Google Calendar, CoSchedule allows me to schedule blog posts, social media messages, notes and checklists all on a unified drag-and-drop calendar. And it too, can be the perfect tool for you whether you work solo, have a small team, or is a larger company, to help save time while growing your traffic. CoSchedule allows you to visually create, update and schedule blog posts and social media messages on a rolling schedule. This is especially so for those days when you get super busy and don’t have time to write posts. If you schedule a post and need to update, rearrange or reschedule, just drag-and-drop on the date. Have social messages queued to your blog post, they too will move with it. Need to manage several authors, assign writing and editorial tasks, leave messages and check in with your team? No problem! CoSchedule is an all-in-one publishing solution that integrates with your WordPress site, and keeps everyone in the loop at the same time. CoSchedule makes it easy to share your content with the integration of social accounts (Facebook, Twitter, LinkedIn, Google+ and Tumblr). You can schedule your social messages while in your edit view, and before the content is published. If you are a Buffer user, you can also integrate it too. Other features I like includes the “Click to Tweet” messages like the one below, that you can add into your blog posts. As well as the “Top Post” feature which sorts your top posts based on social shares. CoSchedule content editorial calendar has helped me become more consistent and focused, as well as helped build my audience and grow traffic. CoSchedule is only $10 a month, but you can CLICK HERE to try it for FREE! I partnered with CoSchedule to bring you this post, however all opinion is that of my personal experiences.